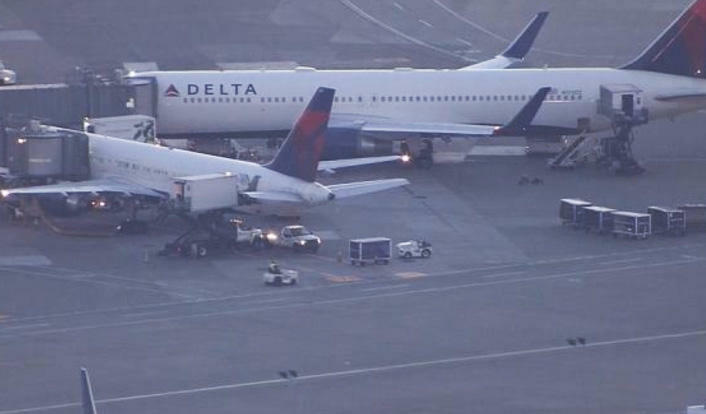 SEATTLE -- A Delta Airlines flight bound for Beijing returned to Seattle-Tacoma International Airport Thursday evening after a passenger assaulted a flight attendant, officials said. A man in first class on Delta Flight 129 assaulted the flight attendant about 45 minutes into the flight, Sea-Tac Airport spokesman Perry Cooper told CBS News. Passengers then helped restrain him until the plane landed back in Seattle and he was taken into custody, Cooper said. Delta said in a statement "The passenger was restrained on board and was removed from the flight by law enforcement without further incident." The suspect, a 23-year-old Florida man, was transferred to federal custody, the FBI's Seattle Field Office said. CBS Seattle affiliate KIRO-TV reports the man was sitting in the first row. He tried to open an emergency exit door when the flight attendant tried to stop him. Apparently, she had to break a bottle over his head. One first class passenger told KIRO five people had to sit on the man and use zip ties to hold him down until the plane got back to the airport. Officials say two people, including the flight attendant, were injured and taken to a hospital with non-life-threatening injuries. Passenger Dustin Jones was seated just behind the curtains that lead to first class, and said he could tell there was a scuffle happening. "One of the flight attendants ran back and said there was a Code 3," Jones told KIRO. "There was a serious fight up front." Jones said he saw the man handcuffed and zip-tied being rolled into the terminal in a wheelchair after they had landed. "He started yelling for help," Jones said. "And so he turned the wheelchair over in the middle of the airport, screaming for people to help him, just being belligerent." The flight left for Beijing later Thursday night. The FBI told CBS News it was interviewing passengers but there was "no information at this time to suggest a national security threat."